Brunch is a weekend institution in Vancouver. And rightfully so. From lavish hotel buffets to brunches at great locations (where you can make a day of it), to the city's top brunch spots for amazing food, this guide will help you plan the perfect place to indulge this weekend. Head to popular places early, especially on Saturdays and Sundays, as many don't take reservations and lineups are common. Get in line, talk to your neighbors, and get ready for some seriously good food. If hour-long waits for huevos rancheros are too much, make a reservation at a hotel restaurant brunch or buffet spot to guarantee a place; especially if you're in a big group or if it's a special occasion such as Mother's Day. Café Medina has been serving up Mediterranean-inspired cuisine, and arguably the city’s best Belgian waffles, since it opened in 2008. Full of quaint, old-world charm, the bistro-style restaurant offers an eclectic selection of breakfast and brunch items. Try the mouth-watering salted caramel or pistachio rosewater sauces for your waffles, or a hearty tagine or cassoulet. Try brunch at The Teahouse in Stanley Park, then spend the day at Stanley Park. Start with a mimosa, Aperol spritz or Caesar and follow up with upscale brunch dishes such as lobster tail egg bennies or duck and waffles, whilst enjoying views of views of the park. Take a stroll afterward to Third Beach to catch superlative sea views. Chef David Hawksworth's eponymous restaurant, located in the historic Hotel Georgia, is the best place to brunch in style. Choose from contemporary brunch dishes with a West Coast flavor and fresh ingredients, or bite into breakfast classic such as an English style 'fry-up' surrounded by award-winning ambiance in an artistically adorned space. Catch a casual brunch in the heart of Vancouver's trendy Fraserhood/Cedar Cottage district. The Bells and Whistles dining and beer hall has an impressive selection of craft beers, ciders, cocktails, and wine to accompany the locally sourced comfort food dishes such as gourmet burgers and sandwiches, salads, chili, nachos and garlic fries. Sip on a float or savor a sundae for an indulgent end to brunch. 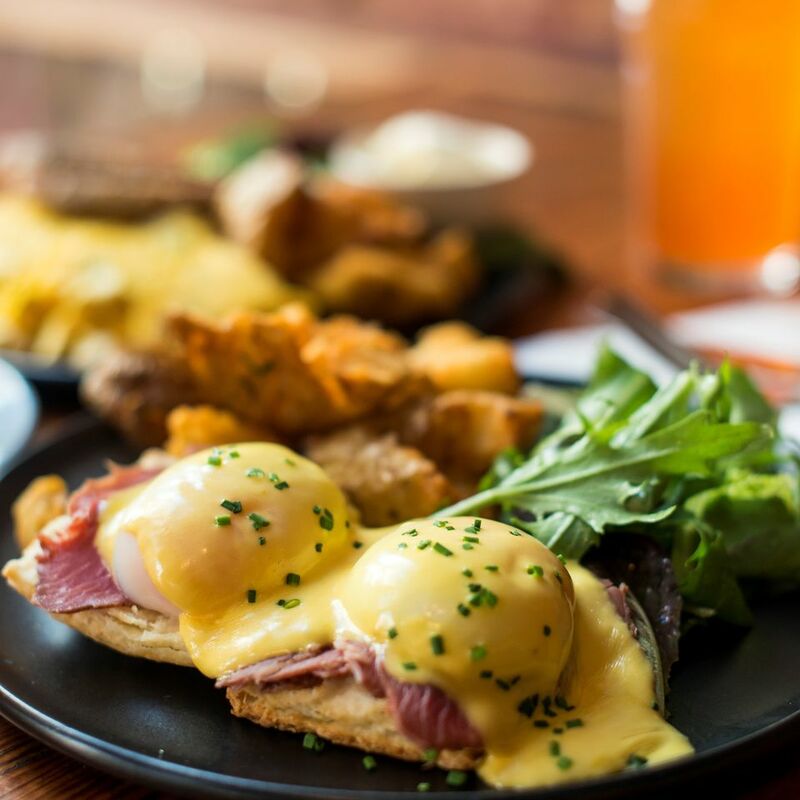 Treat yourself to bubbles at brunch at Gastown's L'Abattoir to toast a tasty menu of upscale burgers, steak and eggs, tartines and quiches in one of the city's most popular brunch spots in the heart of historic Gastown. Make a reservation at Market by Jean-Georges for a weekend brunch or check out the new brunch series called Belle Provence, between June 17 until mid-September, when the Market Terrace will be transformed into a scene from the South of France. Try Provençale-inspired dishes such as brioche pain perdu with pistachio and lemon ricotta cheese and roasted rhubarb and berries, oeufs brouillés à la truffe, salade de branzino grillé, and baguette tartine with olive tapenade, anchovy, garlic, and capers. Originally a Victoria institution on Vancouver Island, Jam Cafe is now a Vancouver favorite as well, so expect lineups if you're heading here on a weekend (and even on a weekday). It's worth the wait to enjoy sweet treats from red velvet pancakes to brioche French toast and breakfast classics such as huevos rancheros and green eggs and ham. Buffet fans can brunch until your heart's content at Westin Bayshore’s H2 Rotisserie & Bar, where the daily breakfast buffet features free-range eggs cooked to order, bennies, pancakes, waffles, smoked bacon, sausage links, seasonal fruit, freshly made pastries, and much more. International flavors include steamed or fried dumplings, pork or chicken siu mai, congee, prawn har gow and bao buns, plus rotating Indian dishes, like curried chicken. Red Wagon is an East Vancouver hidden gem that serves up mighty piles of pancakes with Jack Daniels spiked syrup. Try the Trucker breakfast with eggs, pancakes, and toast to get a true taste of East Van. Sign up for a seat and wander along East Hasting's boutiques if you have some time to kill before brunch. Got a fried chicken craving? Head to Juke Fried Chicken in Chinatown for a brunch of Southern-inspired fare such as the gluten-free, free-range fried chicken and waffles. Pair with a casual beer or a signature cocktail for a fun twist on a traditional brunch. Treat a special someone to a seafood brunch at downtown's Boulevard Kitchen & Oyster Bar. The award-winning fine dining restaurant offers a multi-course seasonal seafood boil on Sundays in the summer, otherwise, the brunch menu is bursting with fresh flavors and succulent seafood for a special occasion. Find French favorites at Kitsilano's Au Comptoir, where West Coast meets the Left Bank. Choose a petit dejeuner that ranges from a traditional croissant to a filling croque monsieur. Brunch dishes include assiette of smoked salmon, charcuterie, cheese, or classics such as duck salad and omelet with fresh herbs. Meat eaters will appreciate the classic butchery skills of Chef Ian McHale in his contemporary brunch dishes that showcase local suppliers and produce from nearby farms. Focusing on simple country cooking, brunch dishes range from avocado on toast to marrow and eggs. Wildebeest is located inside a refurbished 19th-century building in the heart of Vancouver’s historic Gastown district. Found on busy streets such as Davie or Denman in the West End and Commercial Drive, Joe's Grill is a cheap and cheerful all-day breakfast neighborhood joint where you'll find hearty omelets, pancakes, and breakfast hash, with a side of strong coffee, served in simple, no-nonsense surroundings. Ideal for a quick brunch to fill up before a day of sightseeing. Just like the name suggests, Yolks is the place to head for perfectly poached eggs. The food truck turned two-location restaurant specializes in egg bennies, featuring everything from maple ham to avocado or BC sockeye salmon.